I don't go to Carrefour very often, because somehow I always end up spending more money than I counted on. This last time it was because there is a new addition to the cheese isle. There was a nice lady sampling this new product called "fromage à la crème" by Elle & Vire. They have Black Pepper, Chives, and Plain. It's the French answer to Philadelphia Cream Cheese. It comes with a cheese cake recipe on the label and all. Unlike "fromage à tartiner", this cheese has a more robust consistency that should work great in American dessert recipes. I haven't tried it out yet, but I'm pretty sure this one is a winner. Yum. Good to know. I'll have to try it. 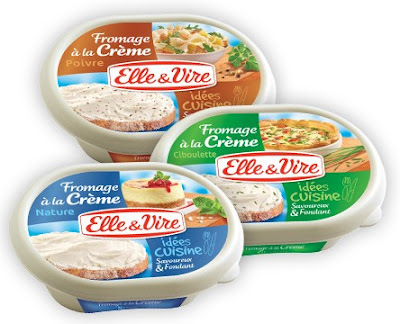 Apparently Elle & Vire (plus a few other brands) hurried up to introduce their takes on cream cheese when they heard that Philadelphia would be sold in France. I've already been able to find Philly here in Annecy, whee!! !